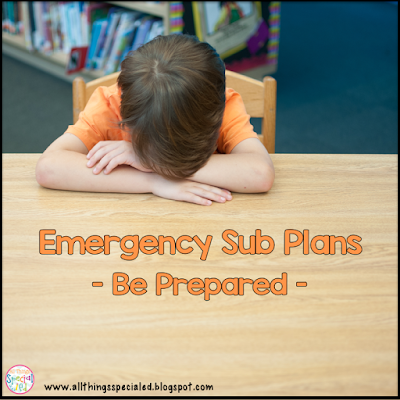 Plan ahead- get your emergency sub plans ready! - All Things Special Ed. Plan ahead- get your emergency sub plans ready! Don't be fretting in the middle of the night- life happens, be prepared for those times you can't write detailed lesson plans for an absent. See how I set up my emergency sub bin so when I can't be at school, I know my students are taken care of! 3. List of passwords and logins to access any computer games, programs, or technology the sub will need to get into or use. 5. Sheet explaining how to use the sub materials that you put together (see details below) as well as where to find games and hands-on materials as well that could be used during the day. 1. In your sub binder make sure you let your sub know where to find the materials and how to use them. I have my schedule along with a sheet explaining that s/he can pull materials from my black three tier drawers for my pull-out groups for each subject I teach (reading, writing, math). 2. 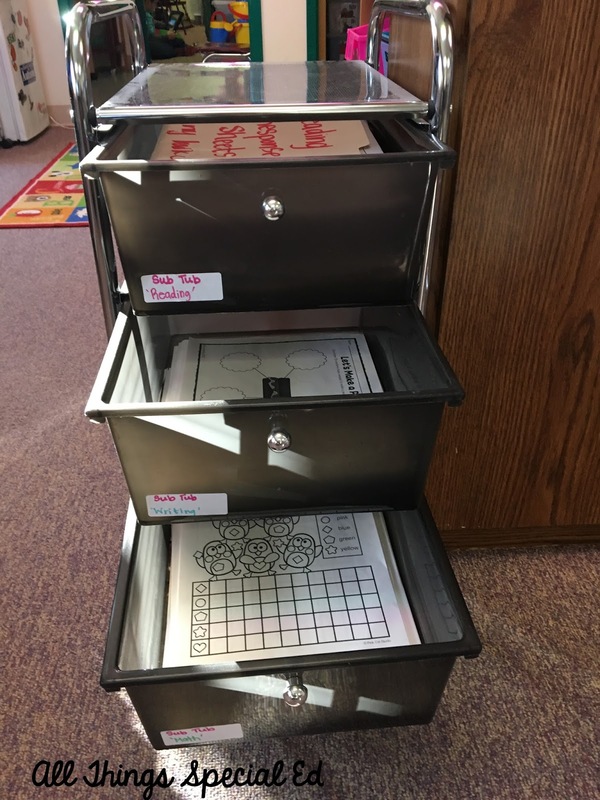 Pull materials that can be used throughout the school year in each bin- reading, writing and math work. Use those teacher books you have sitting in your cabinets or (of course) there are tons of great stuff on Teachers Pay Teachers (free and paid!). 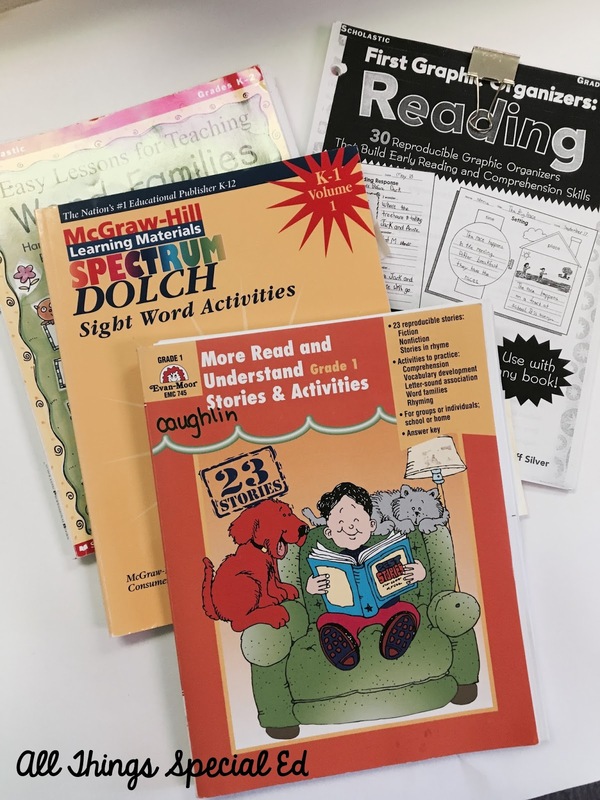 Reading: reading response sheets to use after reading a story, coloring sheets by word families or sight words, teacher books: read and understand, dolce sight words, word families. Writing: seasonal papers, writing papers, graphic organizers to help create stories, picture cards (seasonal) for kids to write lists or sentences, and don't forget to find some great materials in your cabinets or on TPT!! Math: Basic skills sheets- addition, subtraction, word problems, money, more/less, patterns, hundreds chart activities, solve and color sheets (lots on TPT), graphs and the list is endless. Use those teacher books you have stored in your cabinets! Now you are all set! When life gives you those times where you really can't spend writing detailed lesson plans, even though we have all been there in the middle of the night or in the wee hours in the early morning, you won't have to fret as you will be all set up!